Saturday afternoon, Syracuse did not hold the lead in the final 38 minutes of the game and still had a chance to win in the end, but failed to, in large part because they once again could not make free throws. 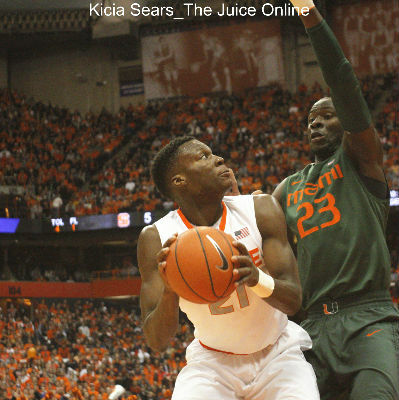 This time, the Orange went a mere 8-of-19 from the free throw line as they dropped a 66-62 home decision to Miami. 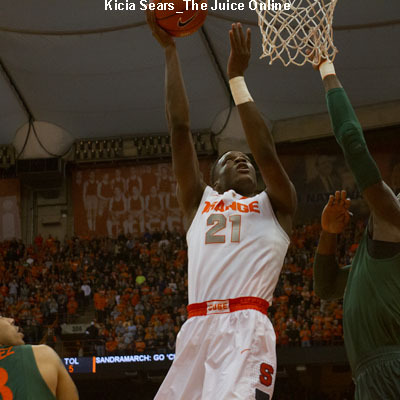 SU (14-6, 5-2 ACC) trailed by as many as a dozen points twice in the second half and got within a single point on two occasions, but the Hurricanes (14-5, 4-2) managed to hold them off. Syracuse did not help themselves by turning the ball over 13 times, but they turned in a superior effort on the glass against a strong rebounding team. The Orange won the battle on the glass, 40-30, and also held a 30-20 advantage in points in the paint. Miami came into the game as a strong three-point shooting team and did nothing to change that, burying ten shots from deep. The Hurricanes showed a strong reliance on the three-ball, with over half of their field goal attempts coming from beyond the arc. Eight of the nine ‘Canes who played tried at least one triple and six of them buried at least one. Rakeem Christmas dropped in a free throw for the first point of the day, but Miami responded by scoring on four of their next five possessions, including two three-pointers, for a 10-1 lead less than five minutes into the game. Tyler Roberson and Trevor Cooney struck back with an 8-3 run for SU, each getting a jumper and lay-up in that span. Roberson continued his strong early play, catching a nice pass from Christmas for a right-handed jam, then tapped out an offensive rebound that Michael Gbinije eventually cashed in by burying a three. That long ball got the Orange within 17-14 with under nine minutes elapsed. Miami hit three in a row from the field, including a triple, for seven straight points to take their first double-digit lead of the game. The Syracuse defense responded by tightening the screws and not allowing the visitors a point for over six-and-a-half minutes. The Orange offense slowly came to life in that span. Kaleb Joseph stuck a three-pointer, then Roberson banked in a pretty jumper off a shot fake. Cooney splashed a three-pointer off the left wing, then Christmas made it ten straight SU points with a lefty hook that knotted the game at 24 a side with under 2:30 left in the opening half. The Hurricanes got a lay-up to end their drought, but Christmas matched it to send the game to intermission at 26-26. After Miami got a quick three to open the second half, Roberson made a shot fake to clear a defender and took advantage, driving in for a two-handed dunk. Miami responded with the game’s next seven points to hold a 36-28 lead just over two minutes into the half. Gbinije hit a jumper to stop the run, but Miami got a pair if threes to power a quick 8-2 burst for a 44-32 lead. Ron Patterson ran the pick-and-roll perfectly with Christmas and fed the center, who banked in a short shot while getting fouled. His free throw made it a nine-point game, but Miami got another three to go back in front by a dozen. The Orange clawed back into the game, hanging an 11-2 run on the visitors. Christmas drove for a bucket, then Gbinije banked one in off the glass in transition. Following a Miami lay-up, Christmas hit a pair at the stripe, then caught a perfect bounce pass from Patterson for a monster slam. Cooney drilled a three to finish the run with Syracuse down 49-46 and 8:30 to play. Less than three minutes later, Patterson splashed a three that sliced the Hurricane lead to 54-52. The two squads traded scores for the next few minutes with the ‘Canes working their lead out to five points. Gbinije had a pair of trips to the line where he converted just one shot each time to clip the margin to three. Christmas made it a 60-59 game with under a minute remaining when he made a pretty spin move on the post and finished with his left hand. Miami worked the clock on the ensuing possession and the move paid off when they buried a three for a four-point lead with 19.9 seconds on the clock. SU hurried upcourt and Cooney canned a trey of his own to make it 63-62 with 12.5 seconds on the clock. After an Orange time out, Cooney would foul after the inbounds pass. Miami point guard Angel Rodriguez coolly made both shots, stretching the lead to 65-62. Cooney tried to tie the score, but his pull-up three drew nothing. The ball did, however, go off a Hurricane player, giving possession to Syracuse with 4.4 seconds left. The inbound play tried to set up a handoff from Christmas to Cooney for a tying three, but the big man was fouled. With 3.4 seconds showing on the scoreboard, Christmas missed the first free throw. The big man then intentionally missed the second shot off the front of the rim, but Miami secured the loose ball. One free throw later, the game was all but over. Rakeem Christmas was a major factor in the second half for the Orange, pouring in 18 of his game-high 23 points after the break. Trevor Cooney had 14 points and added three steals. Tyler Roberson dropped in ten points for the second straight game and also grabbed 14 rebounds while Michael Gbinije chipped in nine points. The Hurricanes had three players in double figures, led by Tonye Jekiri’s 13-point, 15-rebound double-double. Angel Rodriguez tossed in a dozen points and handed out eight assists while Davon Reed added 11 points. The ‘Canes depth was a factor, as all nine players who saw action for Miami scored in the contest. The Orange will be back in action on Monday when they hit the road to face #15 North Carolina. The Tar Heels (16-4, 6-1) have won five in a row and ten of their last 11, including edging Florida State at home on Saturday, 78-74. UNC averages almost 80 points per game on the season, including topping 87 points in a game five times, in large part due to their balanced scoring attack. Five players average at least nine points per game, led by Marcus Paige at 13.8 points per game. Paige has also made 48 three-pointers on the year. The game will be televised on ESPN and be available online at ESPN3.com. The action will start at 7:00pm Eastern.